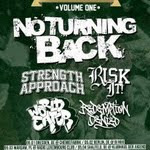 True Spirit Tour bring together bands like No Turning Back, Strength Approach, Risk It, World Eater and Redemption Denied for a series of shows across the Europe - from Belgium to Netherlands to Germany to Poland and more! Check the complete show listing here. And click here the listen to the sampler for the tour! Dance hard or die!